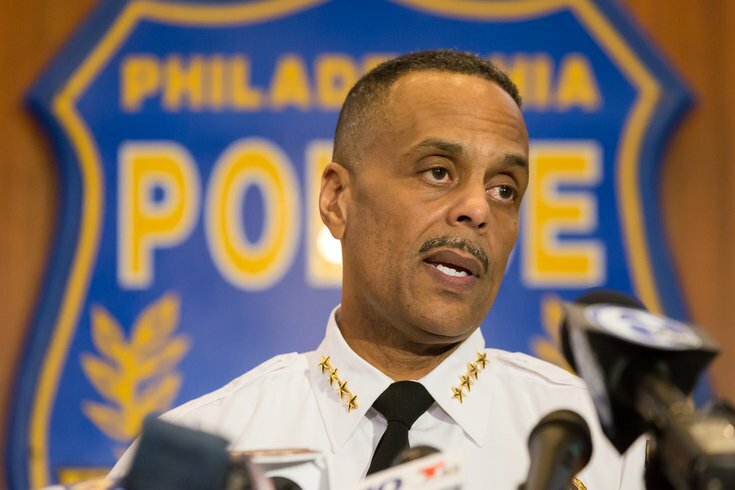 Police Commissioner Richard Ross held a press conference Thursday regarding the recent arrests of two men at a Philadelphia Starbucks, April 19, 2018. Philadelphia Police Commissioner Richard Ross offered a public apology to the two men arrested at a Starbucks last week, saying he understands why they were "appalled" when asked to leave the Center City store. Ross called a press conference Thursday afternoon to apologize to Dante Robinson and Rashon Nelson, two black Realtors who were arrested by his officers while waiting for a friend to join them at the Starbucks at 18th and Spruce streets in Rittenhouse. Ross said he was unaware that Starbucks permits people to sit within their stores for lengthy periods of time without ordering any food. "I can appreciate, in light of the Starbucks policy and how well-known it is to many, why these two men were appalled when they were asked to leave," Ross said. "For this reason, I apologize." Ross said he has not had an opportunity to meet with the two men because his department immediately received a fax from the men's attorney ordering police not to speak with them. The police department has been criticized for the way the officers handled the situation, though Ross stressed that they spent 10 minutes trying to de-escalate the situation. Robinson and Johnson were in the shop for two minutes before a manager called 9-1-1. They were held in police custody for about nine hours before their release. "Again, for those who either blithely – even some maliciously – think that I don't understand issues of race, I'm 54 years old," Ross said. "I've been an African-American man my entire life. Yes, I've been in situations where I've seen racism and prejudice in a variety of ways. "Based on what these officers responded to, I just don't believe that was the case here. As for the manager, that's a whole other ballgame." The department has completed a new policy that will direct officers how to respond in similar situations, Ross said. But he declined to provide details until it is released at a later date. Ross also walked back the comments he initially made after a video of the arrests circulated across social media, prompting protests and national media coverage. At the time, Ross defended the arresting officers by saying they did not do anything wrong. On Thursday, he maintained that the officers acted within their legal boundaries, but said he should have phrased his comments differently. 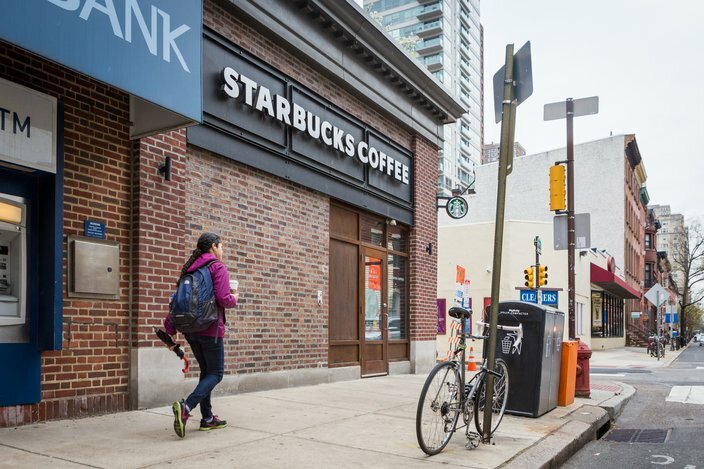 The Starbucks at 18th and Spruce streets in Center CIty Philadelphia. "I should have said the officers acted within the scope of the law and not that they didn't do anything wrong," Ross said. "Words are very important." His words, he said, were shaped by his misunderstanding of Starbucks policy. He said he did not know people routinely gather at Starbucks without making an initial purchase. "It is a widespread belief that everyone knows that about Starbucks," Ross said. "I'm here to tell you that I did not. It is also reasonable to believe that the officers did not know it, either." Ross made his remarks just hours after the two men publicly addressed their arrests for the first time. Speaking on Good Morning America, Robinson said he was surprised to see the police arrive. "I was thinking, 'They can't be here for us,'" Robinson told anchor Robin Roberts. "We have meetings at Starbucks all the time." As the video of the arrests spread last weekend on social media, many people labeled the arrests a textbook example of racial profiling. Ross defended his officers against that assertion. It is not uncommon for several officers to respond to a distubance call, if they are in the area, he said. And they were neither physically or vebally abusive during the arrests. "They were making every attempt to quell the situation that they possibly could," Ross said. "Because there was no policy until now, the law allowed them to (arrest them). And I guarantee you – if you were to take a look – we get multiple calls like that all across the city." But he noted that the issue of race was not lost on him. "The optics are not lost on me," Ross said. "It is obvious the issue of race is indicative of a larger problem in our society. And I should not at all be the person that ... is making anything worse relative to race relations. "Shame on me, if in any way I've done that. To anybody listening, to those involved, that is on me. That is from my heart. This is pure." Ross insisted he decided to call the press conference on his own. "No one asked me to do this," Ross said. "No one made me do this. For reasons that I won't get into, I certainly would not be required to."